There's a sense amongst urban folks (and I used to be one of them) that life on the farm is easy. Pleasant. Relaxed. Lemonade under a shady tree, baby animals bouncing around green pastures (perfectly fenced and clipped), and laser-straight rows of corn, tasseling out under a perfect July sky. While that occassionally happens, there are also days when the weather is terrible, the animals have gotten out, the crops aren't doing well for whatever reason and that alarm clock goes off way too early (or the day stretches way too late). Happily, most days on the farm are somewhere in between those two extremes. But today I spent most of the day towards the "this is not a good day" end of the spectrum. I try to remember what it was like to get up early enough to beat traffic. To get dressed not to meet my own needs but to win the approval of others. To hustle off to work because of someone else's schedule. To attend meetings where I may not say a word and even if I did, my experience and ideas and skillsets had to compete against the prevailing office political structure. I could have invented the very best mousetrap ever conceived by Humanity. But Compliance has to sign off on it, Testing staff won't have time to look at it for at least six weeks, Manufacturing is having a dispute with their suppliers and rollout has been postponed. Plus it doesn't fit in well with Marketing's advertising campaign. While in Corporate America, I often found myself feeling like a cog that didn't fit very well into the machine. 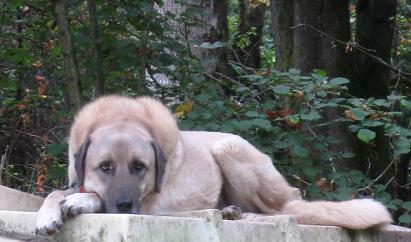 My reverie broke when I glanced up on the hill and noticed one of my livestock guardian dogs watching me. Cougar came to us as a broken individual, his spirit crushed by a string of well intentioned owners who didn't know how to work with his proud race. He also spent a fair amount of time as a stray, wandering the landscape trying to find a place to fit in. Much like I wandered the landscape of office work, wondering where I was supposed to fit in. As I watched him watching me, I realized we'd both found our forever homes - him guarding a farm just as his ancestors have done for millenia, and me managing the farm just as my ancestors have done for millenia. Not every day will be perfect. But most days will be good enough to justify keeping our respective jobs. I walked up the hill and gave him some friendly pets. He thumped his tail a few times but then gave me a look like "sorry, Mom, but I gotta go back to work now. It's important." Yea, buddy, I understand. Your job is important and you do it well. I guess I should remember that mine is important too. Sometimes I'm not sure I do my job as well as he does his, but it's a good job to have. Despite the occassional bad day.